At first sight these two violin concertos would seem to be strange bedfellows with nothing much in common except for a home key. However, vastly different though they are, I found they worked surprisingly well in tandem. Before talking about these performances I ought to say a word about the recorded sound. Some readers may have seen that we discussed this recording – and specifically the first movement of the Shostakovich concerto – as part of the most recent session in the MusicWeb International Listening Studio. Among the comments I reported then was that “the initial impression is that the soloist is rather forwardly recorded” and a feeling that “the listener is made to feel too close to the performers though this view may be modified by repeated listening.” Having had the chance to experience the recording on my own equipment – and in the room where I normally do my listening – I think it’s fair to modify that view. The soloist is indeed prominent in the aural landscape but not to a degree that I found distracting. On reflection, there are passages in the Shostakovich concerto where a prominent balance for the soloist is essential if the violinist is to be heard. Overall, on my own equipment I was happy with the sound that engineer Mike Clements has produced. So what of the performances? The Shostakovich concerto is one of the most intense in the repertoire. Composed in 1948, it had to wait until 1955 for a first performance because the shadow of Zhdanov’s denunciation of Shostakovich and some colleagues hung over the composer until after the death of Stalin. Nicola Benedetti is very intense in the opening Nocturne and her brooding playing receives dark-hued support from Karabits and the orchestra. The soloist is rarely silent in this movement and Miss Benedetti clearly identifies with the music very strongly. This is no display concerto but a soulful utterance and the present performance is exceptionally fine; it’s one that draws the listener in and then doesn’t let go. In a word, it’s compelling. I love annotator Helen Wallace’s description of the second movement as a “savage, sabre-toothed Scherzo”. This is taut, biting music and Benedetti deliberately coarsens her tone to excellent effect. The performance by her and by the orchestra is taut and highly energised. As I indicated earlier, there are passages in this work where the engineers need to give the soloist a sensible degree of prominence and this movement, and its tumultuous ending in particular, offers a case in point. The Bournemouth horns announce the passacaglia balefully. When Miss Benedetti starts to play (1:52) she sounds tender and intimate – two words that she uses in discussing the movement in the booklet. However, the passacaglia is ominous, implacable and tragic and this perceptive soloist ramps up the intensity of her singing lines incrementally, just as she should. Karabits, for his part, builds the power in the music with expert control and seeming inevitability. The transition to the huge cadenza is expertly managed – and a note of appreciation is in order to Decca for placing the cadenza on a separate track. The cadenza is extraordinary. This is not an opportunity for the soloist to show off his or her prowess. Yes, technical virtuosity is required but so is interpretative virtuosity. One can tell that this is section is rhetorically and emotionally important because the composer’s DSCH motif, also in evidence during the second movement, is heard during its course. Benedetti is superb here. The Burlesque finale is exciting and vividly propulsive, though Karabits rightly keeps the music on a tight leash. Both soloist and orchestra offer crisp and strongly projected playing. At the end you feel like cheering. There are many fine versions of this concerto in the catalogue already and I guess that the recordings by David Oistrakh, who premiered it, will continue to have a special place in the affections of collectors (review). However, this newcomer is extremely fine and worthy to join the ranks of the best on disc. The Glazunov concerto is music from another, more innocent age. Yet I think it’s an intelligent pairing because it serves to remind us music can and should serve to entertain us as well as drain our emotions. There’s a wonderful warmth to Nicola Benedetti’s tone as she plays the opening melody and in the first movement – as elsewhere in the concerto – the BSO’s accompaniment is refined. Throughout this movement Benedetti’s sweetness of tone and her ability to spin a long, seamless melodic line are admirable. These are qualities I noted in a recent live performance of the Korngold concerto (review) and it’s great to be reminded of them here. I find Benedetti’s warmth of tone at the start of the second movement completely winning. This movement is richly romantic and Benedetti’s cantabile is ideally suited to it. I must say that her approach is much more to my taste in this music than is Heifetz who can sound rather steely (review). The cadenza (track 7, from 7:14), which is about half the length of the Shostakovich cadenza, is not all about showing off. Miss Benedetti is very fine here. The time for display comes in the rondo finale. This is an extrovert, high-spirited virtuoso piece and it’s played here with glittering precision. In the Shostakovich there’s a good deal of music that’s harrowingly intense but Glazunov’s finale provides an effortlessly cheerful conclusion to the disc. 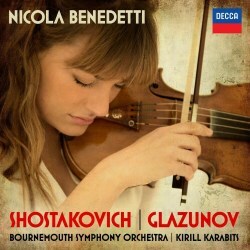 So there you have it; two highly contrasting violin concertos, both of them superbly played by Nicola Benedetti. She receives expert support from Kirill Karabits and his Bournemouth orchestra. Good recorded sound and valuable notes, which sensibly include interesting comments from the soloist, mean that in every respect this is a highly desirable package. To the best of my knowledge Nicola Benedetti has not recorded the Prokofiev violin concertos. Given that she already had an established recording partnership with Karabits and the BSO prior to this disc (review) and knowing that conductor’s prowess in Prokofiev might we hope they will set down those two great concertos in the future? Then there’s the second Shostakovich concerto …. For now, though, this splendid disc will do very nicely.